‍Project for Public Spaces worked with the Municipality of Quito on shaping their public space and placemaking agenda in advance of their hosting the largest UN conference ever, Habitat 3. The success of the placemaking movement has expanded its reach and popularity around the World. Placemaking is revolutionizing the way we create and experience public spaces in countries as diverse as Ecuador, Lebanon or Australia. The legacies of visionaries like William “Holly” Whyte have inspired young entrepreneurs, urbanists and activists from Mexico to Chile and made Latin America one of the most interesting areas to realize the power of public space. During the Habitat III conference that took place in Quito, we were able to strengthen the network and learn from the innovative approaches that enrich the movement from Sweden to the United States. The conversation was open, enticing and engaging. As placemaking moved to the center of the New Urban Agenda, for some of us that week was a journey of discovery. As I dug deep into the reasons for the absence of a landmark contribution from my country to the global dialogue, a few notable findings emerged. ‍Public space and placemaking had a large presence at Quito's Habitat 3, with dozens of events and workshops. The quantity and quality of events and the high level talks that went on motivated a search for the missing piece of the puzzle. Turns out placemaking had been a part of Andean culture for centuries and we didn’t even know it. If we harness the lessons from history, our contribution could be enormous. The creative economy, the diversity of the movement and urban development strategies would benefit. 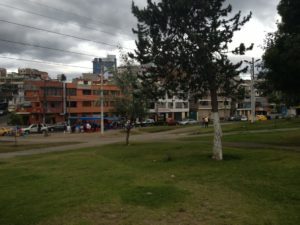 The Minga, or as I like to call it, Ancestral Placemaking, has been in practice in the Andean highlands of Ecuador, Peru, Colombia and Bolivia for hundreds of years. It is a voluntary, collaborative effort in which townspeople of all ages and genders contribute with their work, their motivation, their knowledge or their wit to finish a project of collective interest. Whether it’s a new irrigation waterway, a road, a fence or a corral, everyone partakes of the festive event. It is based on trust and all contributions are received with gratitude, regardless of their size. Contemporary iterations of this time-honored tradition have brought different and more complex forms of adherence. For example, better-off tradespeople in the community often contribute with monetary contributions. The Minga can be a tool for leveraging our cultural traditions to build better cities from the ground up. Mingas are still the preferred strategy for completing small works in rural communities. In later years, urban neighborhoods with strong presence of immigrants from the countryside have also recurred to this practice. In some cases, the Minga has been the counterpart component that communities contribute with when local government provides financing for projects with a requisite of thrift. Conventions so ingrained in the collective are easy to re-purpose to focus on the creation of great places. The methodological components of a placemaking initiative are mostly present in the Minga. My Eureka! Moment came with the realization that this was the missing piece on the question of Ecuadorian contribution to the global dialogue on Urbanism. Quito, Ecuador, and South America have a lot to say and this sort of discovery presages a very successful implementation of the principles of good public space. 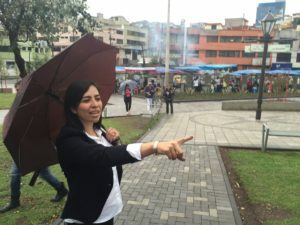 Until 2015, the city of Quito had never seen an actual placemaking initiative implemented as part of a broader public space strategy at the Municipal level. A team from PPS was brought to Quito to build the capacity, and facilitate strategic planning, for placemaking. Strategies were proposed and discussed and ideas emerged to link the methodology with the focus on an existing creative cluster in the La Floresta neighborhood. This area of the city constitutes one of the first “streetcar suburbs” with a traditional street pattern of narrow streets and mixed-use buildings built to the lot line. In later years, artists, architects, designers and all sorts of creative types had moved into the neighborhood’s historic buildings to set up shop. Thousands of members of the academic community convene daily in an area that has more than ten universities and other higher education institutions such as the National Conservatory of Music, a design school and a film school. Cafés, restaurants and other commercial and entertainment establishments followed suit while neighborhood scale shops continue to serve the community. Hardware stores, groceries, cobblers, carpenters and ironmongers dotted the tree-lined streets in buildings that retain some of their original families from the 1940s. Several structures are included in the local Historic Register and a special ordinance maintains a certain degree of harmony in new construction. The Municipality had been looking to implement an Innovation District here by connecting the thriving creative cluster, the academic institutions and the established business community. One of the challenges was creating places where people could meet, since there were only two recognizable public spaces in the area. ‍Parque Navarro before the placemaking process. Two years later, in the summer of 2016, after a lengthy process of consultation, participatory planning, community engagement and construction, Parque Navarro was opened to the public. A rehabilitated public space with new and better design, preserved landmark trees and native vegetation, a road diet applied to the surrounding streets and new stalls built for the food market. It was all achieved with principles borrowed from the placemaking playbook and with a strategy designed after consultation with PPS and championed by then-Vice Mayor Daniela Chacón. ‍Councilwomen Daniela Chacon Arias, who led the placemaking process, touring the renovated park. Almost a year into the new Parque Navarro, the user base has increased greatly. More comfortable facilities for both vendors and clients have improved the sanitary conditions and pollution levels in the whole neighborhood. Complaints for the excess smoke and odors coming from the stalls have decreased. Children have taken over the green spaces and the community can enjoy their public space once again. How might the result have been affected if the principles of the Minga had been intentionally merged with those of placemaking during the rehabilitation process? It is important to note that both practices complement each other, rather than compete. They are mutually reinforcing and together they can strengthen the relationship of the citizens with their public spaces in different levels, as well as within different demographics. Each model’s strength can add to the solidity of the finished product, and therefore to its sustainability. The Minga could have served as a critical tool for securing the continuing support of residents, daily users and business owners. Community engagement is high when people can relate to a familiar practice. As the evidence shows, even those who are not keen to participate directly in the process are likely to embrace and support ideas developed at a Minga. Concepts of community engagement are dear to Latin American cultures. A history of shared values and strong cultural markers aligned with the principles of placemaking could ease its introduction and match it with an update of the language of the Minga to better serve the changing needs of public space in the 21st Century. Great contributions to implement the New Urban Agenda need not be in the form of megaprojects or grand schemes requiring sanctioning at government level. Massive changes can come from harnessing the power of little actions and age-old traditions. The Minga can be a way to introduce Latin America to placemaking. In this way, the Minga can be a tool for leveraging our cultural traditions to build better cities from the ground up. Let’s get started! To further explore, support, and launch the placemaking movement in South America, regional partners will be running a "Placemaking Latino America" conference in early November, soon to be announced.